Righto, hands up who made the commitment to do Veganuary? Now, put your hands up those that are starting to struggle and can feel their resolve wavering. Apparently you’re not alone in feeling this way. I was watching Lorraine on the gym’s TV (yep, I go to a gym!) and Doc Hillary was saying that about 2-3 weeks in is when people tend to chuck the towel in and give up. 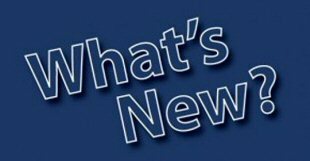 If they persevere just another couple of weeks the habits are established and chances of success are much higher, so don’t give in folks! I personally didn’t commit to doing Veganuary, but I have vowed to be more health conscious and try to reduce my red meat consumption. There’s no way I’m ever going to give up my juicy steaks - I love them too much - but perhaps at 4/5 times per week, I eat red meat too often. 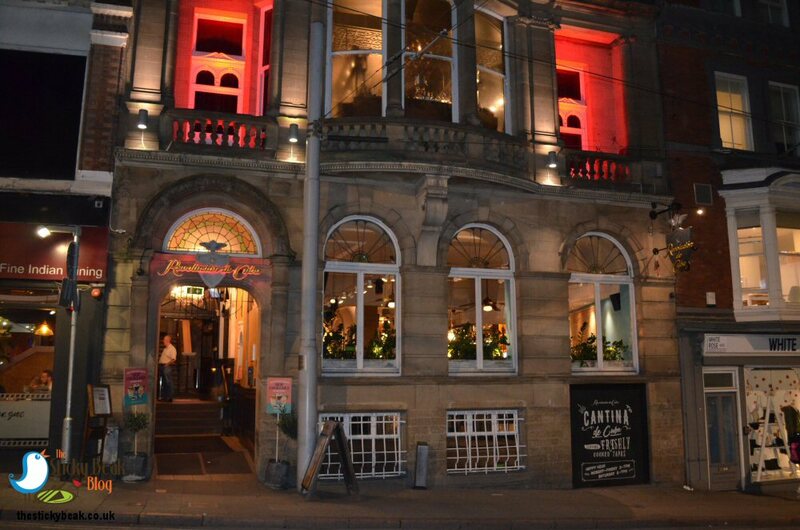 The chaps at Revolucion De Cuba, must’ve felt my distress signals through the cosmic ether and came to the rescue by inviting me and The Man Bird to the Nottingham venue to sample their 100% Vegan Menu. Everyone needs a helping hand sometimes, so I eagerly accepted their kind offer. There was a great buzz when we walked through the door and plenty of folks were chatting, eating, laughing and generally have fun times. As well as couples and smaller groups of friends there were a couple of larger parties in celebrating, so there was a good mix of customers in. Our server, Jessica, took us over to our table and got us some Tortillas to nibble on, as well as some of RDC’s amazing Guacamole; seriously, I could eat this stuff by the bucket load! Jessica also got us some of the zingy Tomato salsa to dip our tortillas into – let the good times roll. The thing I really love about the Tortillas, Guac and Salsa is that you can have them simply as a nibble with drinks, or go for a larger portion and have them as a starter; they are so versatile. 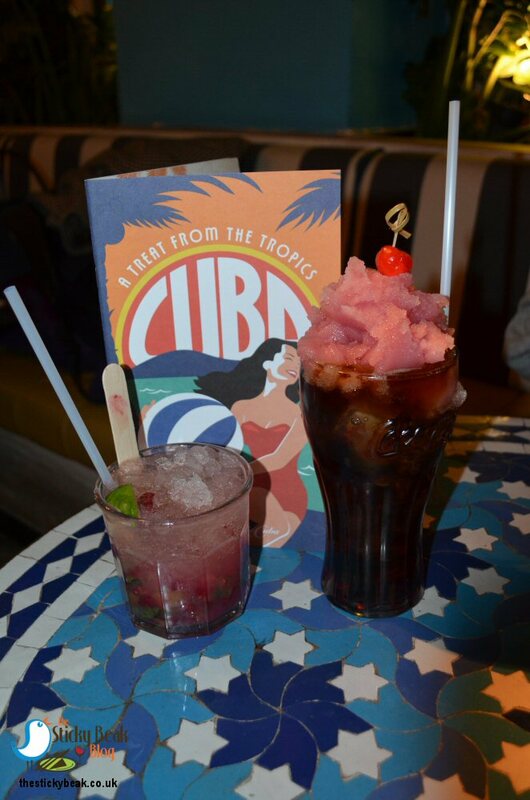 As well as the Vegan menu, Revolucion De Cuba is doing their bit to support the “dry January” crew with the “skinny sipping” drinks menu. This drinks selection offers low or no-alcohol containing drinks, so it’s perfect for dry janners or drivers alike. Lovely as the skinny cocktails sounded, I am a realistic Birdie and figured that I wasn’t going to nail no meat AND no alcohol in one night. I stuck to the stonkingly good Super-Stoked Cherry Coke cocktail all night (!) and His Nibs had a Raspberry Mojito and then switched to the Lavender Lemonade from the Skinny Sipping menu. 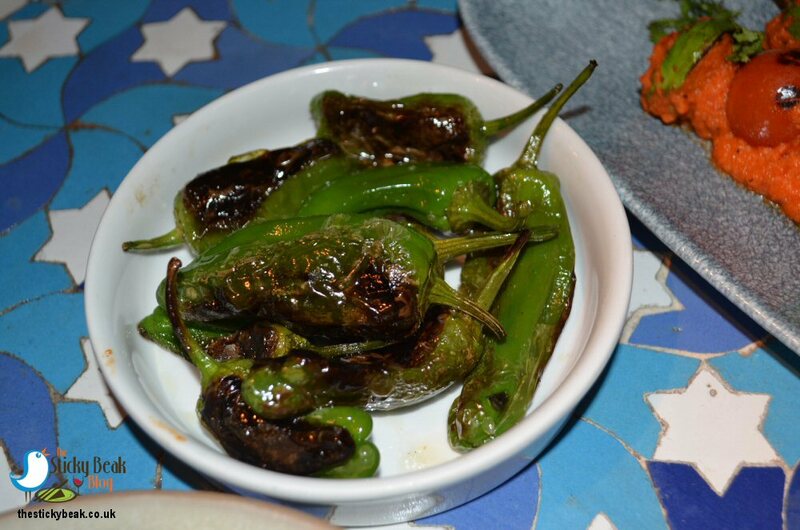 For starters we had some Padron Peppers (labelled as a side dish, but we fancied them to start! 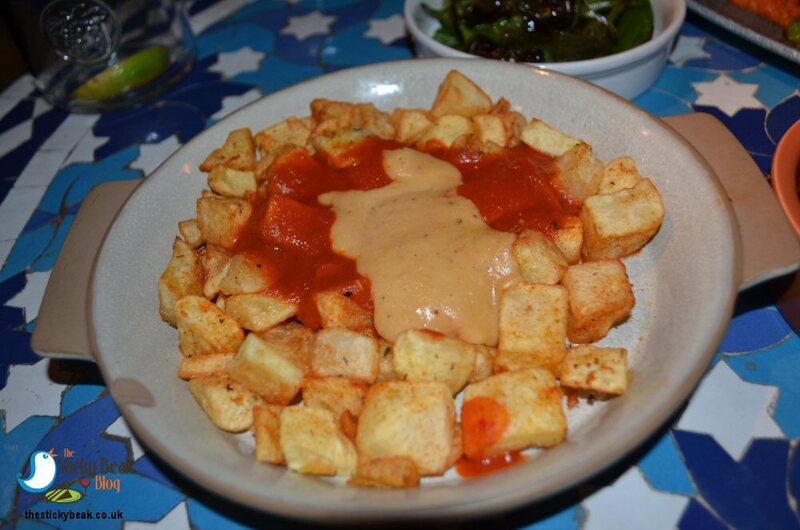 ), Beetballs, Patatas Bravas, and Sautéed Tofu with Romesco. The Padron peppers had a great charring to their outers which gave a fabulous smoky taste in the mouth, more subtle than you would think actually. Lady luck was on our side and we didn’t get any of the “rogue” fiery ones, just the very yummy sweeter, gentler tasting ones. A gentle dusting of sea salt enhanced their flavour even more, so they may be small but they’re mighty to taste. The Beetballs are just a dish of total geniusness! We absolutely LOVED these. They had a wonderful density to their texture, not unlike a regular meatball, but with that gorgeous earthy-yet-sweet flavour so characteristic of Beetroot and a great hint of both Coriander and Mint. As a bonus factor, they have the glorious jewel tones of the vegetable too. 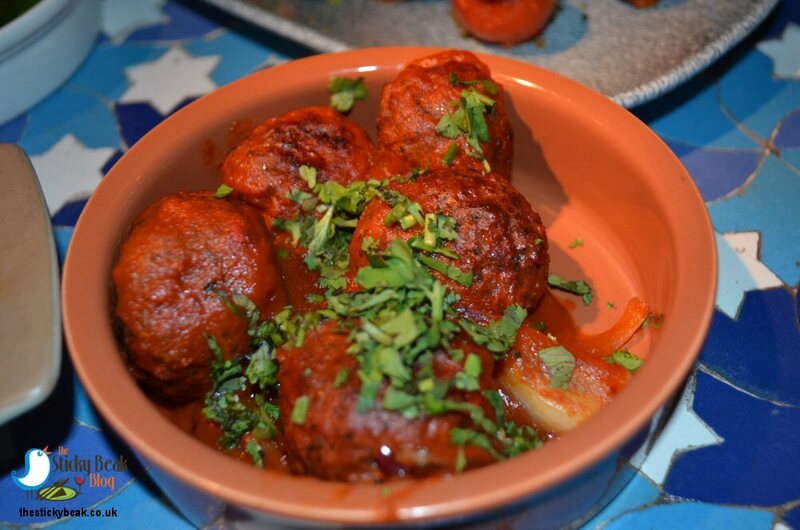 The Beetballs are served in a bath of rich Tomato sauce with sautéed Onions and Peppers in there too! 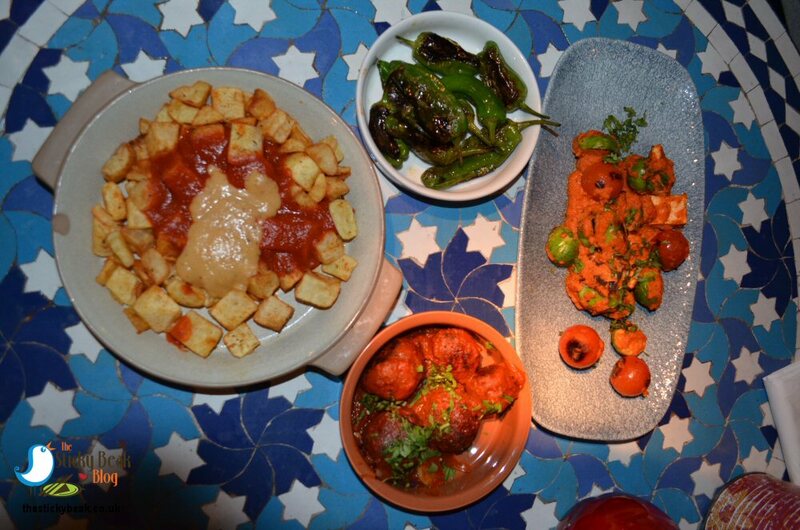 Patatas Bravas is a classic Tapas staple, and the ones at RDC are superb. The cubes of Potato are fried until gentle gold in colour and then topped with RDC’s marvellously zingy Tomato sauce and a delicious, creamy White Bean purée. Both His Nibs and I enjoyed these; the White Bean purée was so moreish and balanced the spiciness of the Tomato sauce really nicely. I’m going to admit to not being a Tofu fan in the least; to me it’s just lumps of nothingness that tastes as bland as it looks. 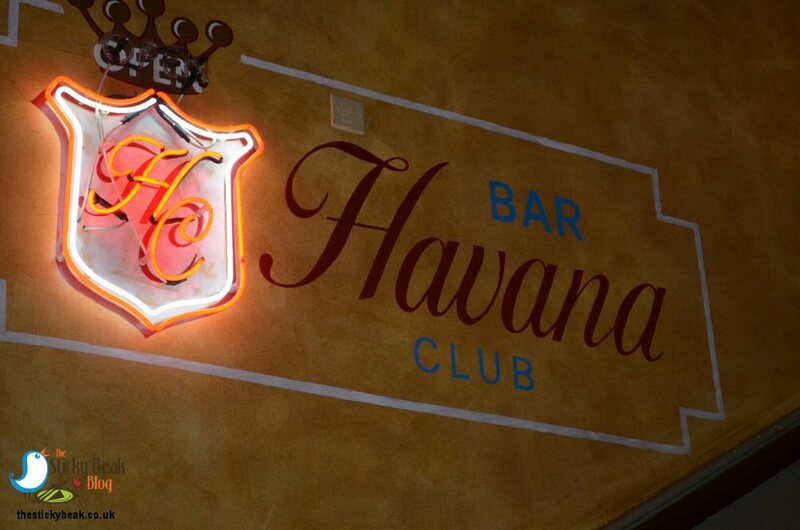 However, I never say never and figured that if anyone can make this white non-entity taste any good, it’d be the culinary team at Revolucion De Cuba. To be fair, the dish does look good, so my hopes were a little higher for something tasty than they would normally have been! The Tofu cubes were surprisingly firm in texture, so I actually had something to bite into and chew – this is normally what I don’t get, and what I miss. Paprika gave a nice flavour to this dish and Brussels Sprouts had been halved and charred, so they added some taste and texture too. Yet again in the Beak nest, the camp is divided when it comes to Sprouts; I love them and can scoff unholy amounts of them, whereas The Man would rather stick hot pins in his eyes than eat them! Roasted whole Cherry Tomatoes were also in this dish, so it wasn’t lacking in either the colour or taste departments. I am happy to eat humble pie and concede that Tofu (on this occasion) was jolly good. Brunch and Lunch dishes are available until 5pm, but we were dining later than that so we chose our mains from the Main Plate section of the menu. I had the Beet Burrito, and The Man Bird fancied the Black Bean and Butternut Squash Chilli. 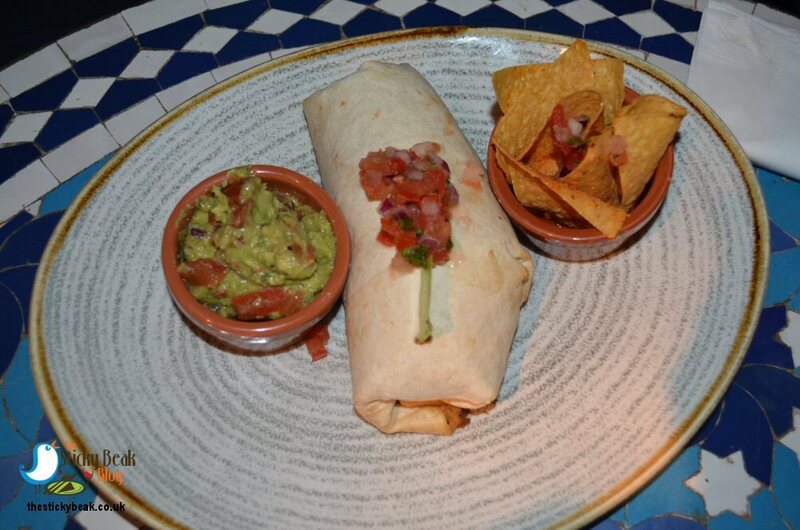 We also ordered a side of Spiced Black Beans, which Revolucion De Cuba developed after being inspired by Havanian (is that a word?) restaurant Dona Eutima. I’ve got to give it to Vegan food, it’s pretty flipping colourful! Two plates of vibrant looking food were placed before us and after the obligatory pics were taken, we tucked in. Whenever I’ve eaten a Burrito at RDC, the size has always been more than generous, and so it was again on this occasion. The soft flour Tortilla was rammed to the gunnels with patties of Beetroot Hash, zesty rice and that superb, creamy White Bean purée. This was a total pleasure to eat with its myriad tastes and, for the textural element, it is served with Tortilla chips and Guacamole (yay!!). Him Indoors was chowing away happily on his bowl of Chilli, pausing only to say “yep, it’s cracking” when asked for his opinion. Further probing revealed that the Butternut Squash cubes were satisfyingly firm to the bite – not hard though - and the soft beans had a great “comfort food” factor to them. The Chilli was a medium heat, so it’ll appeal to a wide audience, and it was the perfect dish for the (frankly, bloody cold) winter night. 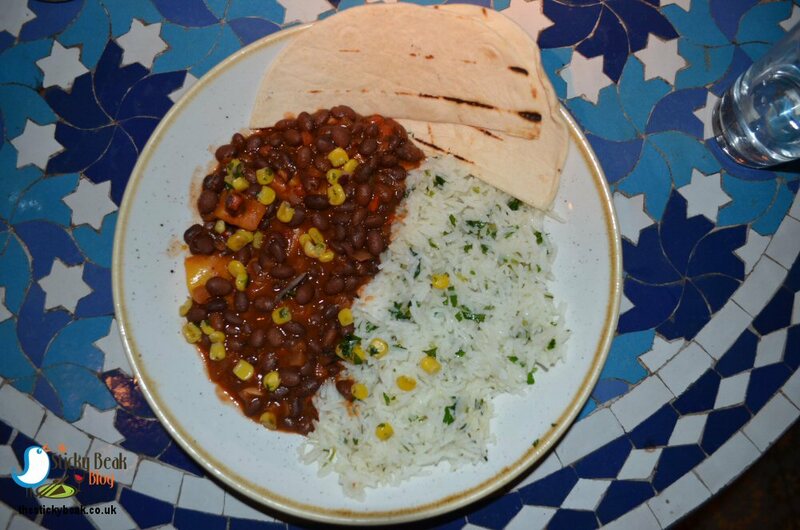 The Sweetcorn salsa was nicely seasoned and the zesty rice was fragrant with the aroma of fresh Coriander in it, so all in all this was a great flavoursome meal choice. Slices of charred flour Tortilla provided the perfect vessel with which to scoop up any last remains of the chilli sauce, so an exceptionally clean plate went back to the kitchen! 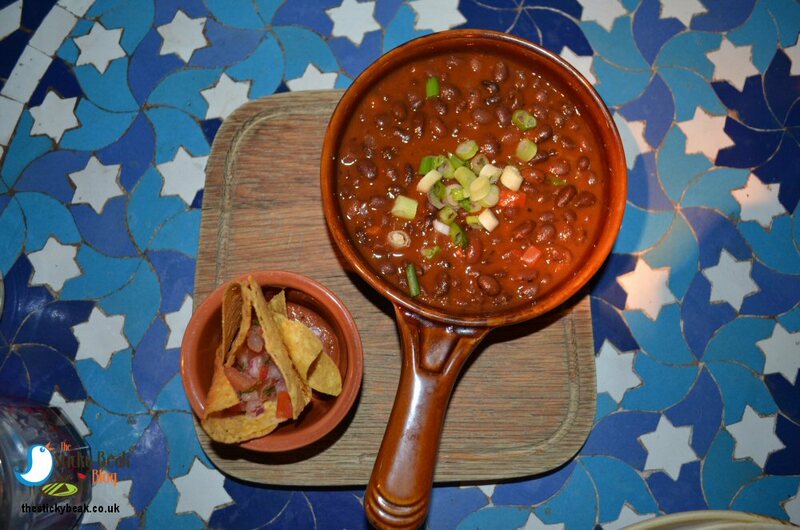 Enjoyed in their own right, the Spiced Black Beans are another fine example of comfort food with their wonderful spiciness and the silky texture of the sauce they’re in. An abundance of Spring Onion slices not only added a pop of colour, but it provided a lovely level of texture to this dish. For dessert I had the Chocolate and Raspberry Slice, served with Raspberry Prosecco Sorbet; The Man Bird had the Raspberry Prosecco Sorbet itself, served with fresh Raspberries and a sweet Raspberry Purée. My Coconut and Raspberry bake had a really nice texture to it, not too heavy or stodgy, and the Chocolate topping was akin to Ganache in texture (very indulgent!). 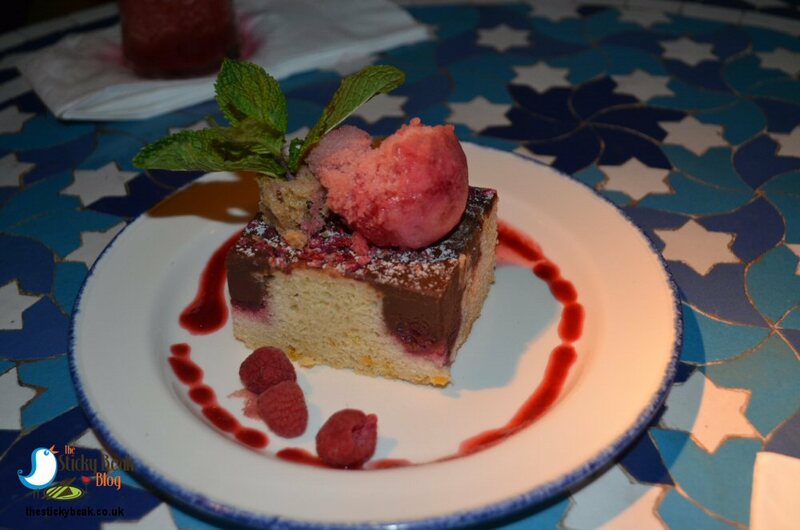 The Raspberry Prosecco sorbet was the key to keeping this dessert light on the tummy, and the combo of fruit and chocolate was a knock-out. I was a very happy little soul with my entire meal. 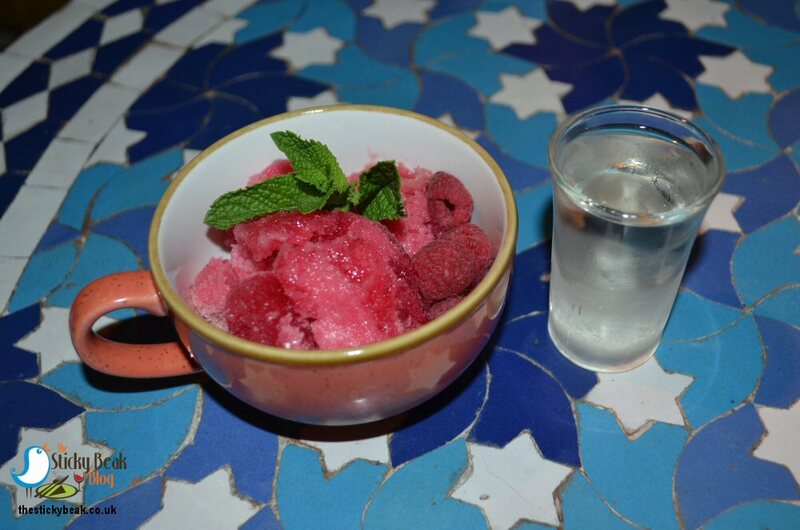 Unsurprisingly, the Raspberry Prosecco sorbet was refreshing on the palate, but The Man Bird was more impressed by the fact that it wasn’t overly sweet; the slight tartness of Raspberry was clear in the mouth. The Raspberry Purée was vastly more intense in flavour and certainly made His Nibs’ taste buds sit up and pay attention! Fresh Raspberries burst on the tongue and dazzled with their vibrancy, enhanced by the bubbles from the shot of Prosecco served on the side. 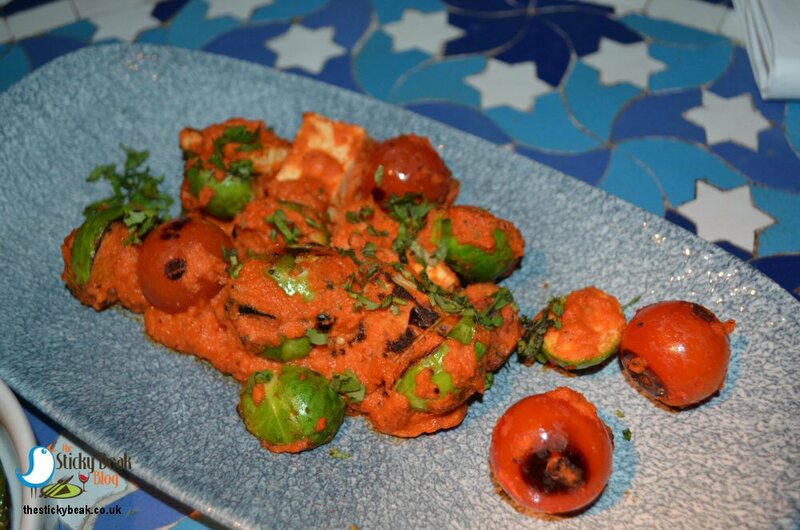 Both of us thoroughly enjoyed the Vegan dishes we’d sampled and one thing to draw your attention to is the fact that a lot of the dishes on this menu are gluten free too, so good choices for those sensitive to Wheat, or for those with Coeliac disease. Knowing now how good the dishes are, there are a couple that I would definitely go back and try. On the starter section I would definitely be tempted by the Garlic Mushrooms; sautéed Mushrooms cooked in a garlic and White Bean sauce sounds delicious. The Beet and Avocado Taco also sounds amazing: Beetroot, Coriander, and Mint hash, fresh smashed Avocado, White Bean purée, Spring Onions, and Chillies served in a trio of soft corn Tortillas – I bet these would be divine! So there you have it folks, your inspiration for the rest of Veganuary; the added bonus here is that you don’t have to do any cooking or washing up afterward. Winner winner, chicken-free dinner !. Given the meat free theme, I shall skip saying Hot Wings, but kudos deserved by the Revolucion De Cuba team in Nottingham again.